Are you nervous about taking the Canadian Citizenship test? If so, this software can help you! It will give you a very good idea of what to expect on the actual Canadian Citizenship test. Why not get this application and pass the Canadian Citizenship test in one shot? 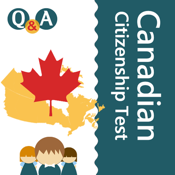 This application aids new immigrants to learn more about Canada and have all the information you need to pass the Canadian Citizenship tests. - Chapters summary from the study guide - "Discover Canada"
Fast-track your Canadian Citizenship knowledge and pass the examination today!